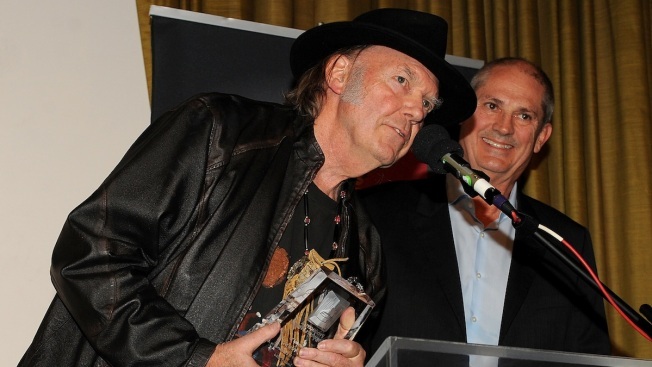 Honoree Neil Young, left, accepts The Recording Academy President's Merit Award from P&E Wing Co-Chair Mike Clink at the Producers and Engineers of The Academy's 7th Annual Grammy Week Event, at The Village Recording Studios, on Tuesday, January 21, 2014 in West Los Angeles, Calif.
Neil Young is still rockin' in the free world. The legendary 68-year-old musician was celebrated Tuesday night by the producers and engineers wing of the Recording Academy. Young received his award on stage during the group's seventh annual Grammy week celebration at The Village, a historic Los Angeles recording studio that's hosted the likes of the Beach Boys, Mariah Carey, Johnny Cash, Ray Charles, Eric Clapton and Elton John. The National Academy of Recording Arts and Sciences honored Young for his artistic creativity, philanthropic efforts and sonic integrity for a career that's spanned more than four decades, including his time with Buffalo Springfield and Crosby, Stills, Nash and Young. "You're honoring me, you're honoring yourself," Young told the crowd of music industry professionals. "It's not me. It's you." Young recalled working on the recording of his 1975 song "Like a Hurricane" at The Village and lamented the rise of digital recording. He also used his acceptance speech to plug his upcoming high-fidelity audio service Pono, which translates to "righteousness" in Hawaiian. The singer-songwriter, who's sometimes referred to as "the godfather of grunge," didn't pick up his guitar at the event, but Dave Matthews made a surprise appearance to pay tribute to the musician. Accompanied by only his guitar, Matthews crooned the folk song "Rye Whiskey" and played Young classics "My My, Hey Hey" and "The Needle and the Damage Done." "As a person, you're one of the most amazing people I've ever met in my life," Matthews said after performing the trio of tunes. "I hope that I'm half the inspiration to people that you have been to me." Other artists in attendance at Tuesday's event included Colbie Caillat, Kris Kristofferson and Chad Smith of the Red Hot Chili Peppers. Young and his band Crazy Horse's recent album "Psychedelic Pill" is up for best rock album at Sunday's Grammys against Black Sabbath's "13," David Bowie's "The Next Day," Kings of Leon's "Mechanical Bull," Led Zeppelin's "Celebration Day" and Queens of The Stone Age's "... Like Clockwork." The show will be broadcast live on CBS.